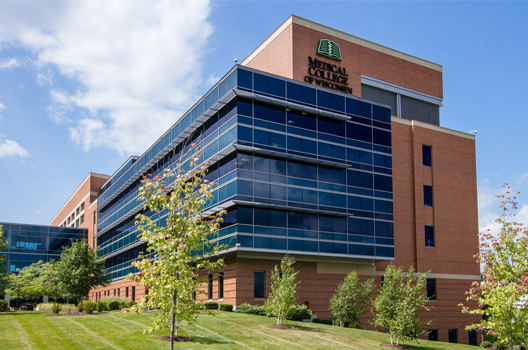 The Medical College of Wisconsin (MCW) is a private freestanding health science university widely known for its beautiful campus and close affiliations with key clinical partners throughout Milwaukee and all of Wisconsin. MCW has over 5,298 faculty and staff. More than 1,700 physicians from the community serve as volunteer faculty. MCW has the 14th largest group practice and the 7th largest academic group practice in the nation. The college supports an adult (MCP) and children’s practice plan (CSG). To be a national leader in the education and development of the next generation of physicians and scientists; to discover and translate new knowledge in the biomedical sciences; to provide cutting-edge, interdisciplinary and compassionate clinical care of the highest quality; to improve the health of the communities they serve. The Medical College of Wisconsin was originally founded in 1893 as of the Wisconsin College of Physicians and Surgeons. In 1913, the Wisconsin College of Physicians and Surgeons and the Milwaukee Medical College merged to become the Marquette University School of Medicine. In 1967, the school separated from Marquette University and continued as a private, national, freestanding institution. Its name was changed in 1970 to the Medical College of Wisconsin and has approximately 13,500 alumni. MCW has a strong research focus and has emerged as a major national center for medical research. The institution has experienced dramatic growth over the past 15 years. The formation of extremely strong basic science and clinical departments lead to continuous improvement in NIH ranking. MCW has $86 million in NIH funding, and remains in the top third of medical schools receiving NIH finding. In the last fiscal year, the College received $138 million in total grant awards for research from all funding sources. Annually, MCW faculty direct or collaborate on more than 3,000 research studies. Nearly 1,450 scientific papers by MCW faculty are published in peer-reviewed medical journals. There are eight institutions in Southeastern Wisconsin that form the Clinical Translational Science Institute (CTSI) and MCW is the lead institution. The five-year award is being used to create a borderless, synergistic biomedical research enterprise that will accelerate the translation of research discoveries into new and improved medical treatments. MCW providers care for approximately 500,000 patients, representing more than 1.6 million patient visits annually throughout the three teaching hospital affiliates, Froedtert Hospital, Children’s Hospital of Wisconsin (CHW), and the Zablocki Veterans Affairs Medical Center. The Medical College Physicians (MCP) group includes 1,350 MCW physicians and more than 500 nurse practitioners, physician assistants and other health care practitioners that provide adult patient care. MCW faculty represent the top of their field, with 446 MCW faculty listed in Best Doctors in America®, more than any other group practice or institution in Wisconsin. Children’s Specialty Group (CSG) includes more than 350 pediatric specialists, 170 pediatric advanced practice nurses and physician assistants. All CSG physicians have faculty appointments within the Medical College of Wisconsin. CSG provides a critical link between Children’s Hospital of Wisconsin and the Medical College of Wisconsin. More than 23,000 infants, children and adolescents were admitted to Children’s Hospital of Wisconsin and another 305,000 were seen in the hospital’s specialty outpatient clinic urgent care sites. The Medical College offers M.D., Ph.D., Pharm.D, M.S., M.P.H. and M.A. degrees. The College educates 820 medical students, 400 graduate students, and supervises 850 physicians in graduate medical education (residency and fellowship training) programs. Another 200 scientists are engaged in postdoctoral research fellowship training. The Medical College of Wisconsin is growing to educate more physicians each year with new medical school campuses in Green Bay and Central Wisconsin. Through collaboration with regional civic, healthcare partners, the new campuses will train the next generation of family practitioners, general surgeons, and psychiatrists to bring quality medical care to widespread Wisconsin communities, where doctors are needed the most. MCW-Green Bay opened its doors to the inaugural class in July 2015. MCW-Central Wisconsin is on schedule to open in July 2016. Once established, both campuses will target a class size of 25 students per year, employing a 3-year curriculum model. The campuses will blend the excellent educational resources that MCW provides with the opportunity to learn in a community similar to that where students will eventually practice. The vision for the MCW School of Pharmacy is to prepare pharmacists to meet the growing healthcare needs of society. MCW Pharm. D. graduates will have the knowledge and expertise to practice at the “top of their license” and contribute to patient‐centered care ensuring optimal medication therapy outcomes by working as a team along other healthcare professionals. The MCW School of Pharmacy is anticipated to launch in 2017 or 2018, following accreditation, with an expected class size of 60-70 students. Froedtert Hospital is a 524-bed academic tertiary care facility. It is the principal adult hospital affiliate of MCW. Froedtert and MCW form the only academic medical center in eastern Wisconsin, serving as a regional referral center for advanced medical care. Froedtert is a major teaching and research hospital with more than 1,000 medical, nursing and health technical students in training, and participates in over 1,600 clinical trials and research studies each year. In addition, the hospital is one of only two Level I adult trauma centers in the state. The delivery of high quality, safe care is embedded in the culture and at the forefront at Froedtert Hospital. Froedtert Hospital ranks among the top 10 U.S. academic medical centers in the University HealthSystem Consortium’s (UHC) 2015 Quality and Accountability Study. This is further demonstrated as Froedtert Hospital was re-certified by The American College of Surgeons in 2010, distinguishing it as providing the highest standard of care for severe injury and illness. Froedtert and MCW was named in 2015 as a Top 100 Hospital by Truven Analytics in the Major Teaching Hospital Category. In addition, Froedtert Hospital has achieved Magnet designation for excellence in nursing services by the American Nurses Credential Center’s (ANCC) Magnet Recognition Program. The Birth Center is in the midst of a four-phase expansion project. The Labor and Delivery and post-partum and antepartum floors will be state-of-the-art on full completion, slated for September 2016, with capacity for about 4,000 annual deliveries in the 51-inpatient bed facility. The new unit has four private triage rooms, 12 Labor, Delivery and Recovery rooms, and three state-of-the-art operating rooms. The largest is equipped to handle the complex fetal intervention procedures. Children’s Hospital of Wisconsin (CHW) is the pediatric hospital affiliate of MCW, and is the region’s only independent health care system dedicated solely to the health and well-being of children. The hospital, with locations in Milwaukee and Neenah, Wisconsin, is recognized as one of the leading pediatric health care centers in the United States. It is ranked in nine specialty areas in U.S. News & World Report’s 2015-16 Best Children’s Hospitals report. CHW is home to a level 4 neonatal intensive care unit which cares for more than 700 critically ill babies each year. Children’s provides primary care, specialty care, urgent care, emergency care, community health services, foster and adoption services, child and family counseling, child advocacy services and family resource centers. CHW is known nationally and internationally for many of its specialty programs including cardiology and cardiovascular surgery, cancer and blood disorders, gastroenterology, newborn and fetal care, and its Level 1 Pediatric Trauma Center. In 2014, CHW invested more than $102 million in the community to improve the health status of children through medical care, advocacy, education and pediatric medical research. Children’s achieves its mission in part through donations from individuals, corporations and foundations and is proud to be a member of Children’s Miracle Network Hospitals. The Fetal Concerns Center operates in close collaboration with Froedtert & the Medical College of Wisconsin. The partnership and proximity of the organizations provides convenient and coordinated access to the highest-level care for both mother and infant, producing consistently excellent measures in safety, quality and outcomes. In January 2007, Children’s Hospital of Wisconsin dedicated a new, $140 million biomedical and translational research facility. The research center is a collaboration of Children’s Hospital of Wisconsin and the Medical College of Wisconsin. The 298,000-square-foot, state-of-the-art research facility includes space for bench laboratory research and vivarium space, as well as other shared service support space and administrative support. The 168-bed Clement J. Zablocki VA Medical Center is one of the busiest and most comprehensive centers operated by the Department of Veterans Affairs. MCW faculty members conduct approximately $10 million dollars in research at the Zablocki VA. A major hospital affiliate of the College since 1946, the Zablocki VA admits 6,400 patients and records more than 533,000 outpatient visits annually. Froedtert Health Community Memorial Hospital is a 202-bed hospital serving the needs of residents in Waukesha, Washington, Milwaukee and Ozaukee counties. The hospital specializes in cardiovascular services, women’s health, cancer care, orthopedics and advanced surgical procedures. Community Memorial’s Emergency Department is a Level III Trauma Center and the hospital is accredited by the Joint Commission as a certified advanced Primary Stroke Center. Community Memorial Hospital has a Level II special care nursery and delivers about 1,000 women per year. Froedtert Health St. Joseph’s Hospital provides a wide range of inpatient and outpatient care to Washington County residents. It specializes in birthing services, cancer care, emergency care, orthopedics, surgical services and women’s health. In 2005, St. Joseph’s opened a new 70-bed hospital that earned national recognition for a design emphasizing patient safety and quality. The 143-acre hospital campus also includes the Kathy Hospice, Froedtert Health West Bend Clinic-South and Froedtert and MCW Specialty Clinics. A 16,000-square-foot cancer center opened at the end of 2012. Additionally, the hospital’s emergency department is a designated Level III Trauma Center. St. Joseph’s Hospital has a Level I special care nursery and delivers about 750 women per year. As a pioneering leader in science and medicine, BloodCenter of Wisconsin (BCW) contributes to the discovery, diagnosis, treatment and cures for patients. BCW provides a safe and stable blood supply for 56 hospitals in 29 Wisconsin counties. They also provide testing and consultation services that help transform a unit of blood into a life-saving gift. BloodCenter of Wisconsin’s Blood Research Institute (BRI) on the Milwaukee Regional Medical Center campus, houses its basic research programs. A $21 million, state-of-the-art research facility, BRI occupies 89,000 square feet. The facility includes 8 Core Laboratories that provide cutting-edge equipment and related specialized services in support of BRI research. Recent completion of an on-site GMP facility provides investigators with the ability to prepare stem cell-derived therapies for clinical trials. Housed within the BRI are the laboratories of 21 investigator-level scientists and approximately 120 research and administrative staff, including more than 40 postdoctoral fellows, graduate students, research scientists and research associates. The Department of Obstetrics and Gynecology has twenty-eight physicians, nine allied health professionals and seven genetic counselors providing all areas of subspecialty care including mental health. Physicians practice at Froedtert Hospital, CHW, Zablocki Veterans Affairs Medical Center, Planned Parenthood of Wisconsin, St. Joseph’s Hospital, Community Memorial Hospital, United Hospital System of Kenosha, Agnesian HealthCare, and local community clinics. Our patients deliver within the Froedtert and MCW Birth Center. The Department of Obstetrics and Gynecology at the Medical College of Wisconsin offers exceptional teaching, learning, and research opportunities for students, residents, and fellows. We are committed to prepare dedicated physicians and researchers who will provide excellent, comprehensive care to women of all ages and backgrounds. Medical Student Education: To advance the skills of medical students, the Department has developed multifaceted learning experiences to address both rare and common obstetrical and gynecological concerns. With an established third year clerkship, medical students are immersed for six weeks participating in clinical rotations, simulations, team-based learning, and traditional didactic teaching to establish a rich foundation in treating women’s health issues.Additional fourth year electives are available for students to gain valuable experiences in gynecologic oncology, urogynecology and pelvic reconstruction, high risks obstetrics, reproductive endocrinology and infertility, and women’s health. Students participate in all aspects of management, including decision-making, surgery, and postoperative care. Resident Education: Placed across three teaching hospitals, residents engage in an integrated experience bridging together academic and community training. To assure for a team-based approach to care, residents work closely with medical students, fellows and faculty, further advancing procedural experience. With the support of a one-to-one mentor, residents develop and complete an individualized resident research project, exploring various research methodologies and study designs. Fellowship: The Maternal-Fetal Medicine fellowship is a three-year program fully accredited by the American Board of Obstetrics and Gynecology. With both research and academics in the forefront, clinician scientists are trained to excel in and advance care for pregnant women with medical, obstetric or surgical complications, which impact mother and fetus. Medical Education Research: Educational research is a cornerstone in the preparation and advancement of today’s physician. To address this requirement, the Department of Obstetrics and Gynecology has a commitment to investigate and implement best practices when working with medical students, residents, and faculty. Instructional Designer: A unique role within the Department, the instructional designer collaborates with faculty, the subject matter experts, to advance teaching, learning, and educational research as it applies to medical students, residents, and fellows. By incorporating principles of adult learning and diverse pedagogical practices, the instructional designer engages in the development and delivery of face-to-face and online learning experiences. Department of Obstetrics and Gynecology is highly committed in women’s health research, spanning from gynecologic oncology to general obstetrics and gynecology, maternal fetal care, urogynecology and reproductive medicine. The Department has 4 research-dedicated faculty in addition to several research intense clinicians who form the foundation of this work. Research is funded by NIH, private foundations and the Women’s Health Research Program. The Department’s infrastructure provides grant and clinical trials management and IRB and regulatory assistance. The administrative team includes a research manager, four highly talented research coordinators, two nurses, one research assistant and a laboratory technician. The team is instrumental in supporting the NCI cooperative group oncology studies, industry-sponsored studies and investigator initiated trials in both oncology and Women’s health. The Department has a robust tissue, blood and data bank. Research Coordinators assist with collection of snap frozen malignant and normal tissue along with whole blood, cord blood and placentas. The department is engaged in many activities in the Milwaukee community. Some examples include education programs at Escuela Verde, a multi-community partnership around appropriate LARC use, and City of Milwaukee Health Department and Boys and Girls Clubs partnership on improving HPV vaccination rates in adolescents.